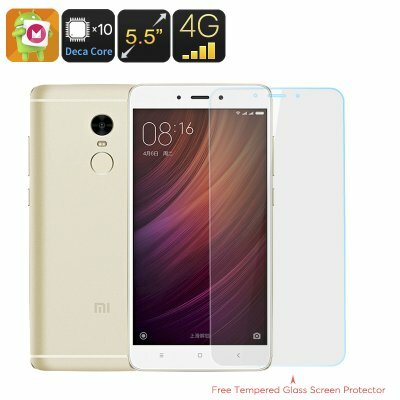 Successfully Added Xiaomi Redmi Note 4 16GB Smartphone - Deca Core CPU, Android 6.0, 2GB RAM, 16GB Memory, Dual SIM 4G, Fingerprint Scanner (Gold) to your Shopping Cart. The Xiaomi Redmi Note 4 has some incredible specs for the price and is set to muscle in on the premium mid-range phone market with its Deca-Core CPU, 2GB RAM and 5.5 inch full HD display. The Xiaomi Redmi Note 4 is the 4th edition of the large screen flagship killer devices and features a trimmer metal design with a brushed finish for a classic hi end handset that really looks and feels the part. One of the most obvious updates that the Note 4 benefits from is a Deca-Core Helio X20 chipset that when combined with the 2GB of RAM brings a solid performance easily capable of running games without dropping frames or any hiccups. All this power is controlled by the Miui 8 interface which brings the full Android 6.0 functions in a uniquely customized and intelligent package. A large 5.5 inch display boasts full HD resolutions and Xaiomi claim this screen has a maximum brightness of 450 nits, which, would mean it really outshines the competition and offers great viewing even on bright sunny days. When it comes to connectivity you get the standard Wi-Fi and Bluetooth features and with dual SIM card slots the Note 4 lets you run two SIM cards simultaneously, as the phone is unlocked you can connect to a wide range of supported providers for 2G 3G and most importantly 4G with great coverage across much of the globe. This 16GB storage version won't limit the apps you can download as with the micro SD card you can easily add an extra 128GB of space so even the most enthusiastic movie and music fans will have plenty of rooms for their media library. As for the battery, the Redmi Note 4 comes with a 4100mAh battery bringing it a good usage time so you can enjoy all these top features for longer.